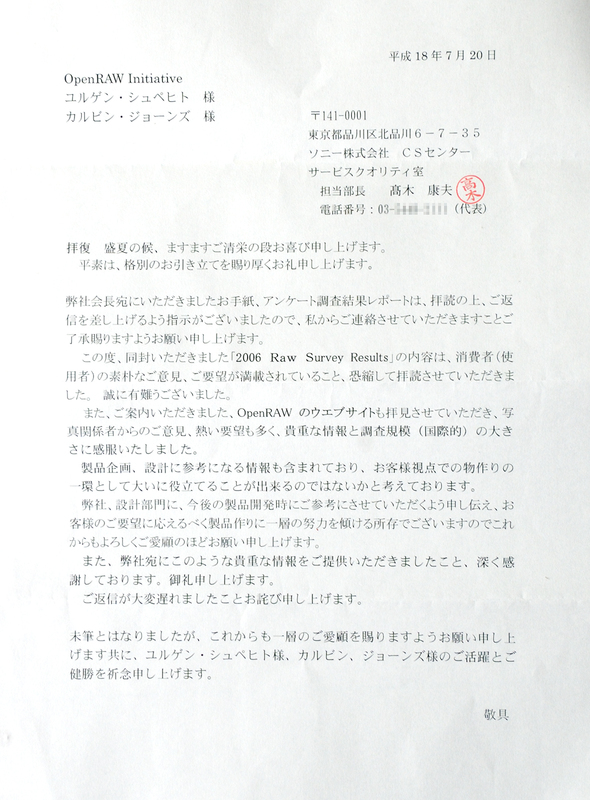 In June 2006, the OpenRAW team sent out printed hardcopies of the 2006 RAW Survey report to the top management of Canon, Nikon and Sony in Japan and a few days ago we received a "thank you" letter from Sony. please kindly excuse that I am writing on his behalf. information and for making it available on the World Wide Web. Some of the information is useful for planning and designing new products. sending us such valuable information. Thank you very much. Please pardon the delay in writing to you. Mr. Juergen Specht and Mr. Calvin Jones. the RAW image files produced by their digital cameras. position in opening RAW image technology. Thank you again for your kind reply. Being a KM Maxxum 7D shooter ( and an eventual Alpha shooter, if I upgrade), the prospect of Sony adopting OpenRAW would be a great boon! Looking forward to seeing Sony adopting the openraw format!